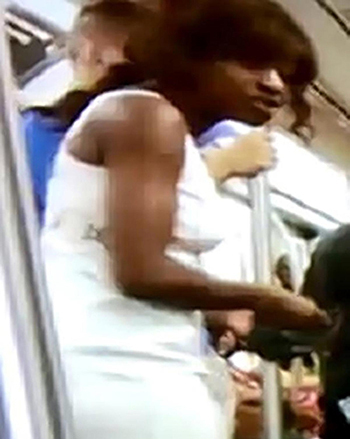 New York City police are seeking the public’s help in identifying a woman who used her high-heeled shoe to bloody a 75-year-old man during an attack last month on a Manhattan subway train. According to cops, the suspect was arguing with the victim as their train pulled into the Times Square station before noon on August 19. The attacker, cops allege, removed one of her shoes and slashed the pensioner across the face. The victim suffered a laceration during the assault and was transported to a local hospital for treatment. In a bid to identify the suspect, police released the above photo, a still from a cell phone video recorded by a passenger. Investigators estimate that the stiletto attacker is about 25 years old, weighs 120 pounds, and is 5’ 7” tall.